The Word Forest Organisation founders, Tracey and Simon West, run an ethical publishing house called Magic Oxygen. 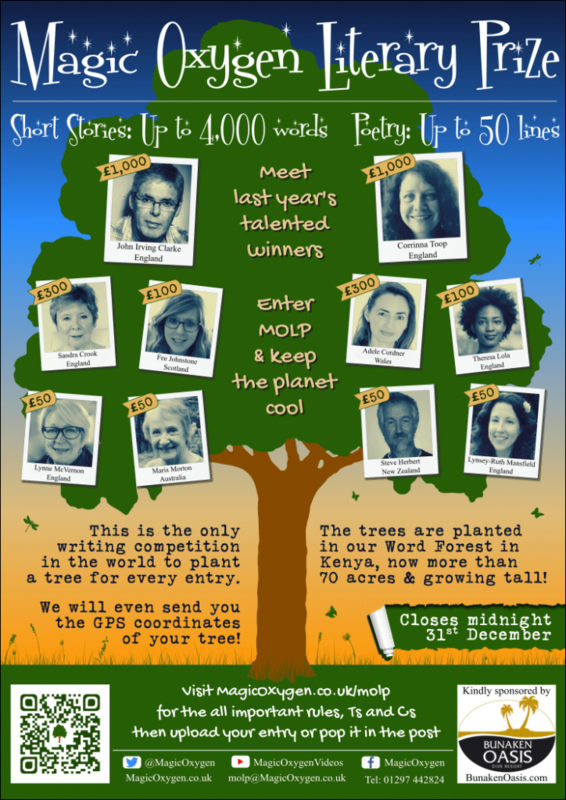 In the spring of 2014, they launched a pioneering global writing competition called the Magic Oxygen Literary Prize; it became fondly known as MOLP. to send every entrant an electronic certificate with the clickable GPS co-ordinates of their tree. Ru Hartwell, an international forestry expert (and more recently, a Trustee of the Word Forest Organisation), chose Bore to site the Word Forest for several reasons. He knew Magic Oxygen wanted to plant a legacy forest that would make a positive difference to the earth. Bore is located fairly near the equator and therefore would be incredibly efficient at locking down the CO2 from the atmosphere as the trees grow so quickly there. He also had first-hand knowledge of the area and knew how devastated it had become as a result of mass deforestation. A long-term tree planting project in Bore would not only benefit the planet, but would also have an incredibly positive effect on the community, as the trees would also provide the community with food, medicines, shelter and protection from the elements and reintroduce biodiversity. In time, it would generate an income for them too; to date, the Bore Word Forest is 71 acres large. Alex Katana, Ru’s right hand-man and the resident Project Manager in Bore, mobilised the whole community to get involved with the tree planting, including many of the children who attend Kundeni Primary School. There are around 300 children on their register, many of whom sleep on the premises because it’s simply too far to walk to. Despite the fact that it’s a primary school, several youngsters attend who are in their late teens and early 20s. Their families needed their labour to work the land so they could bring in desperately needed income, consequently, those children missed out on basic schooling. However, many parents reconsidered their position when the Kenyan authorities said all children should be encouraged to get a proper education and supported them to do so. Educating 300 children at Kundeni Primary School had been a challenge however, as up until Magic Oxygen got involved, they only had one decent classroom which housed around 30 youngsters at a time; it had been provided by another fundraising project headed by Ru. There were a handful of other ramshackle buildings dotted around the grounds, most of which were condemned and a danger to life to be in. MOLP paid for the building materials and labour to construct the first of two new classrooms at Kundeni Primary School and in the summer of 2016, the first one was handed over to Headmaster, James Kithi and the children – they were absolutely delighted. The children have better attendance because the learning conditions have been greatly improved and it has also attracted new pupils to join the school. In December 2016, following some very successful fundraising by Magic Oxygen, work began on the construction of the second classroom and as the weather has been kind, progress of the building has been swift. The foundations are solid, the walls are complete, it has been rendered inside and out and the next step is the roof. We’ll report again soon with news of the positive impact these school buildings have had on lives of the children at Kundeni and we’ll bring you inspiring images showing the build of the second classroom – for now, enjoy the images of classroom number one, of many more to come!